There are so many insanely great techniques these days for creating images that go beyond the limit of camera sensors and lenses. Blending multiple exposures can be used to expand dynamic range for more stunning color and detail. Panoramas can be used to create extremely wide angles of view for unique and powerful compositions. I previously showed how to create and correct a super-wide pano with a single exposure. But some scenes, like this waterfall and mountain image, require both blending and panorama techniques. Step #1: Combine all the exposures for each camera angle. This should be done first, because creating multiple panoramas can create alignment challenges. Select all the exposures for a given camera angle by <shift> or <ctrl/cmd> clicking on them. Right-click and choose Photo Merge / HDR. Turn off auto-alignment if you shot on a tripod (as there is some risk that it may actually cause misalignment). I generally leave “auto settings” off, but it doesn’t matter. 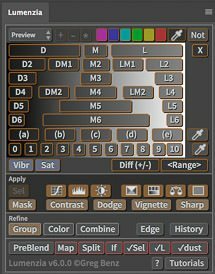 You can change them later in the Develop Module (this option just presets some Develop Sliders, typically to boost shadows and reduce highlights and compress the overall tonal range). Set de-ghosting to low (if you have some moving clouds, water, etc) or none (otherwise). If you have substantial moving elements in the image, you may need to clone later in Photoshop or consider a more advanced tool for your panorama. The “show de-ghost overlay” just shows where de-ghosting will occur and has no effect on the output. Check “create stack”, as this helps to keep things organized. Repeat the process for each view (using the same settings for all). Step #2: Combine all the new HDRs into a panorama. Select all the HDRs by <shift> or <ctrl/cmd> clicking on them. Right-click and choose Photo Merge / Panorama. Try the Spherical or Cylindrical projections (it is unlikely you’ll need perspective). A single-row pano theoretically should use cylindrical, but the spherical can sometimes produce a desirable result. Turn off “auto crop” initially to see the edges of the image. Adjust “Boundary Warp” as desired to fill in areas of missing pixels. Turn on “auto crop” as needed to remove any remaining missing pixels, or leave it unchecked if you prefer to use content aware fill in Photoshop to fix these areas instead. Both are good options, depending on how critical the content is at the edge of your image. At this point, you should have a final RAW (DNG) file which may be processed just like any other RAW file in Lightroom and Photoshop. If you want to learn how to multi-process RAW files to extract maximum color and detail using luminosity masks, be sure to check out my new Exposure Blending Master Course.